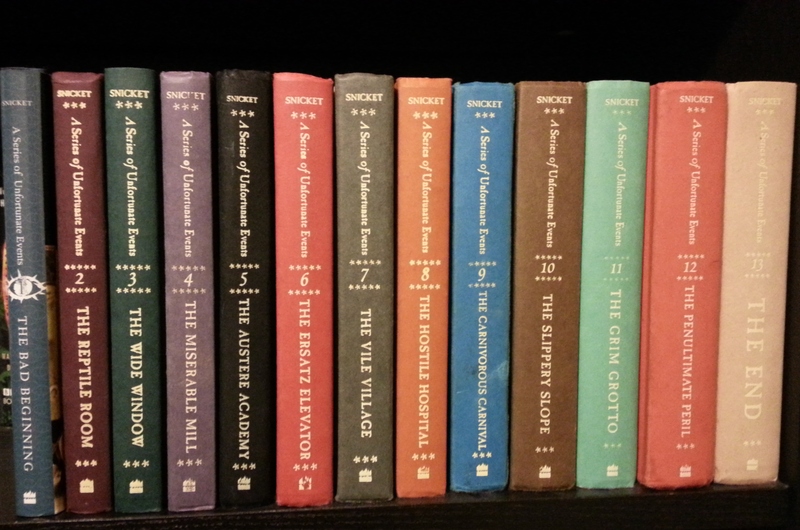 Published on November 13, 2014 May 17, 2015 by Rachelle J.
I’ve been coming across quite a few articles and things about Lemony Snicket’s “A Series of Unfortunate Events” (17 Legitimate Lessons We All Learned…, What A Bad Beginning: Netflix And Lemony Snicket To Re-Adapt…, and Which A Series of Unfortunate Events Character…, just to name a few). I LOVE these books. They are my automatic go-to when I’ve had a yucky day, when I’m in the foulest of moods, and when I’m sick enough that my brain can’t handle anything above children’s fiction. I also love reading them in November. Unfortunately, I have too many other books that I’m trying to finish this month (which is almost halfway over already! ), so I’m not going to start another, no matter how great or how quickly I can finish it. However, sharing my favorite quotes from the books might be enough to satisfy me until I have an afternoon to pull one of them off the shelf. There are far too many quotes to share all of them. So, I’m only sharing quotes from books 1 through 6. At some point in the future, I’ll share my favorite quotes from the rest of the series. I’m not allergic to cats. I love cats. I wish I could afford to have a cat. I’m also not allergic to anything else that I know of (except for the standard allergies that everyone has after living in Texas for awhile). However, I love this quote because it humorously and intelligently states the obvious and doesn’t include “you idiot” or “duh”. There’s no eye roll or condescension. That’s one of the reasons I love these books so much. The frequent stupidity of adults is pointed out without once ever making adults out to be inferior. They’re human like everyone else, and they have faults and other things that trip them up or keep them from seeing the truth or paying attention to the important things. The lesson to take away is not to avoid becoming an adult or that all adults are bad, but to avoid developing those ways of thinking that make you blind to reality. With one exception, the following quotes are similar to the first one in that they are statements of common sense, which isn’t so common after all. What are your favorite quotes? Is there something else you learned from “A Series of Unfortunate Events”?